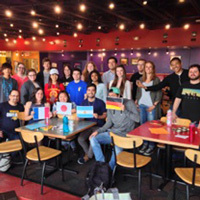 On April 21, Webster's teaching assistants from Argentina, France, Germany, and Japan hosted a special trivia event at Marletto’s Café for students who had regularly attended their individual language tables throughout the academic year. Around 20 students participated in the Collaborative Language Table Trivia Event. Each of the four teaching assistants (TAs), Camille Fernandez, Paul Hellriegel, Matias Ochoa and Michiko Sasaki, host a weekly language table in Spanish, French, German, and Japanese. The purpose of the language table is for students to practice speaking the language they study at Webster University. “The idea was to have one last big event before the end of the school year,” said Fernandez, the French TA. This was the first time the teaching assistants have combined their language tables. As students arrived, they were separated into teams. Each team had a representative from each language. With this arrangement, students were able to meet new people and cooperate with students who had interests different from their own. They were also able to learn about a different culture and language than what they usually studied. The event started with simple challenges, such as drawing the flags of the teaching assistants’ countries. It became more challenging as the event went on. Later, each team was given a flag from a specific country about which they answered questions. Then, they switched flags with the other teams for the next country. This gave everyone in the group a chance to answer questions about the culture and language with which they are most familiar. One of the questions, required students to name a famous song from a particular country; there were even opportunities to gain an extra point by singing the song as well. Another challenge was to list as many words about a specific topic, such as “family” in the appropriate language. At the end, points were tallied and the winning team was given homemade muffins. All other attendees shared baked treats and snacks. “I’m glad that so many students attend the event. It worked out perfectly,” Fernandez said. For the language students, this event was about showing appreciation for the efforts the TAs throughout their year at Webster. Fernandez, Hellriegel and Ochoa will leave Webster at the end of this Academic Year. Sasaki will stay at Webster for an additional year. Each of the TAs has made a huge impact on the students in just a short time and they will be greatly missed.